The plaque can be viewed at the St. Petersburg State Electrotechnical University, Russia. Aleksandr S. Popov (also spelled Popoff) was born on 16 March 1859 in Krasnoturinsk, Russia. One of seven children, he attended a Russian Orthodox seminary to encourage him to follow his father's profession, the priesthood. But while in the Seminary he became interested in physics, which led to his admission to the University of St. Petersburg. He graduated with distinction, and stayed on one additional year as a laboratory assistant. In 1883 he joined the Russian Navy's Torpedo School as an instructor. This afforded him the use of the School's extensive library to continue his research. In 1890 he began teaching at the Marine Engineering School, part of the Russian Naval Department. It was here that he was required to sign a non-disclosure statement concerning his work, which would prove detrimental to his claim as an inventor of radio. During his tenure at the School he taught electrical engineering, math and physics. He studied the works of Hertz, Lodge, and others. It was his intention to invent an instrument that could detect lightning. On 7 May 1895 he demonstrated his apparatus to the members of the Russian Physical and Chemical Society. Popov's receiver consisted of a metal filings coherer he had developed as the detector element together with an antenna, a relay, and a bell. Although not initially meant as a means to transmit "intelligence", it proved the feasibility of radio. Over the next several years he continued his research as a director (appointed in 1901) of the St. Petersburg Electro-Technical Institute. 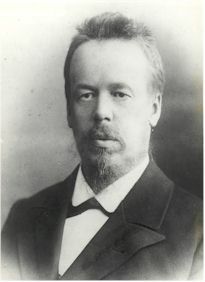 He died on 13 January 1906 in St. Petersburg. In 1945, 7 May was declared "Radio Day" in Russia, in honor of Popov's accomplishments.